OP, with more than thirty years of experience within the hose and tube processing equipment industry, will be at MECSPE in Parma from 17th to 19th March: visit our booth L44 pav.2! 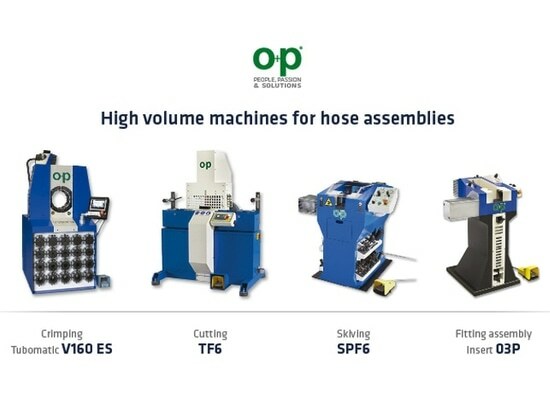 OP is pleased to offer to their customers a a wide range of hydraulic hose and tubing processing equipment, for instance a complete line particularly suitable for the high volume production of hose assemblies: the crimping machine V160ES, the cutting machine TF6 and the preassembling machine Insert 03P. 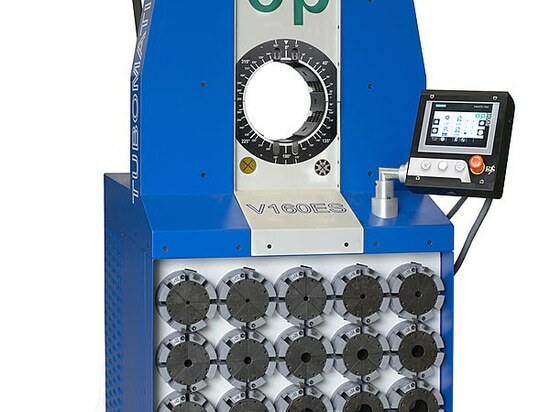 The model V160ES is a high volume crimping machine, ideal for crimping hoses up to 3” six spirals and industrial hoses up to 6” . The crimping force is of 345 TON, the max. crimping diameter is of 160 mm and the motor power is of 7,5 KW. The grease-free crimping head is particularly narrow to crimp big hose ends even with large flanges.. The cutting machine TF6 is ideal for cutting hydraulic and industrial hoses with a capacity of up to a max diam of 160 mm. TF6 is designed to make cutting hose easy for the operator while still being suitable for cutting big spiral hoses and in series (3” multispiral). Thanks to the machines strong structure which is typical of all OP machines, it can withstand the high vibrations caused by the cutting process. 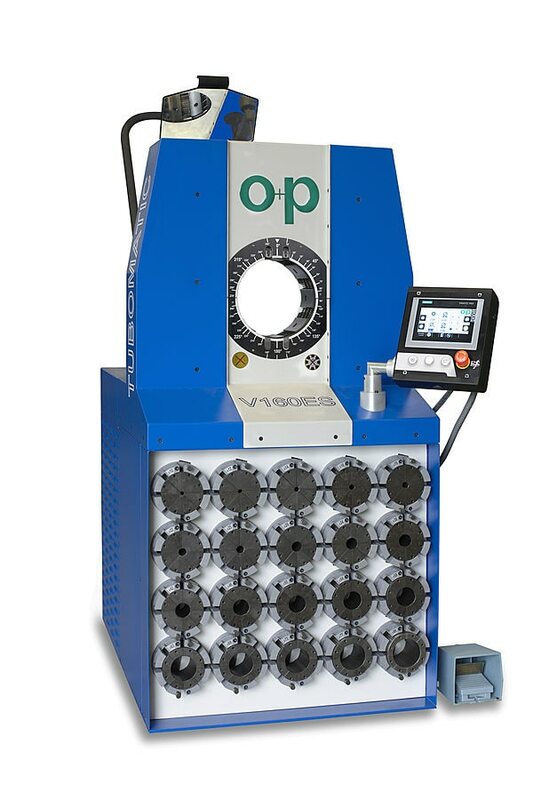 INSERT 03P has been designed to pre-assemble straight and curved fittings on hoses before crimping: this operation must be done carefully , making sure that the fitting is well positioned in order to avoid any rupture. Thanks to the ease of use, it works pneumatically, it allows to adjust the self-centering vice locking pressure – so the fitting is perfectly positioned on the hose – and to choose different stroke regulations. We hope to meet you many of you there!